As a guy with a wide range of interests, simply one listing of links to websites I enjoy just isn’t enough! Xenorama – Xenorama is “the page of heroes and monsters,” along with an amazing article about an alternate version of The War of the Gargantuas. Side Order of Ninjas – Funny and entertaining reviews of strange and amazing films. Hauntcast – The internet’s premier online radio station for home haunters and Halloween enthusiasts. Grindhouse Database – The cult movie community’s answer to the Internet Movie Database. Weird NJ – Strange destinations and urban legends from New Jersey. Home Haunt News – News and reviews no haunter should be without! alt.horror.cthulhu – One of the few newsgroups out there that has regular, non-spam activity. Skook – Tons of great artwork, including modernized (but faithful) renditions of Paul Blaisdell creations. Tomb It May Concern – If Yor Week isn’t enough to convince you to read this, I don’t know what will. Tough To Kill – An amazing look at European action flicks by Paul Cooke and the owner of the above site. Home Haunter’s Haven – The name says it all. The Laughing Reindeer – Back in the day, there used to be a website called “Monster Shindig” that reviewed horror movies, roadside attractions and the like. Although it died, one of its creators set up this blog. Did I mention that he was one of the people responsible for Carnivore? Monster Shindig – I found this while looking for information about the now-defunct monstershindig.com. It’s not related, but still seems cool. 3B Theater – Any bad movie review site inspired by Strange Brew is okay with me! AV Maniacs – Formerly “DVD Maniacs.” Great reviews and an even greater forum! It’s been a long time since the Front Office showed how to get a free download of the movie Pig. Too long, in fact. That’s why I’m stepping up to the plate with another free movie download. This time around, it’s an interconnected series of short films called The Werewolf Cult Chronicles. Although filmed in Sweden during the early 2000’s, the series itself is in English and spans a variety of time periods and countries, from 1916 England to Canada in the year 2019. Although the idea for the series came to creator J. Pingo Lindstrom in 2000, it was not until 2003 that the first installment was released. Said installment, Chimera, pits unsuspecting soldiers against a werewolf during an attempted rescue mission. While its low budget gives the series a rough start, director Mike A. Martinez still manages to deliver some effective and creepy scenes. The opening sequence alone is a must-see and does somewhat balance out the fact that only one of the werewolf’s hands (or is that paws?) is seen for the bulk of the creature’s rampage. However, later installments of the series do show more of their lupine stars. According to the official website, where you can also find the downloads, The Werewolf Cult Chronicles is allegedly responsible for the creation of both the first Swedish werewolf movie and the first Swedish Vietnam war movie! And to think, they’re kind enough to let you download it for free. As it has a Creative Commons license, it might be worthwhile for budding horror hosts to ask the filmmakers for permission to use the films on their program rather than use the same old (and sometimes legally dicey) public domain films that everyone seems to be using these days. Said host shouldn’t let the recentness of the films bother them, as the older hosts they seek to emulate used films that were relatively recent. After all, 1950’s horror hostess Vampira showed movies from the 1930’s, the equivalent of a modern host showing films from the 1980’s. In fact, the legendary Svengoolie played 1999’s Ragdoll in 2004! Originally, Godzilla foe King Ghidorah was supposed to have rainbow-colored wings. Although this idea was eventually abandoned, it did make its way into some early publicity pictures. Back when 8mm horror master Nathan Schiff was shopping around his low budget epics to VHS companies, one wanted to release The Long Island Cannibal Massacre under the name “Cannibal Hookers 2: The Father’s Story.” Naturally, Schiff was less than pleased about the idea and the release never happened. In 1978, an Italian film company made an unauthorized semi-sequel to the 70’s King Kong remake called Ciao Maschio (known as Bye Bye Monkey in America). In the 80’s, Atari was developing a video game based on The Entity. I really, really hope it was based on the freeze gun scene and not the film’s most infamous sequence. Many horror fans are at least somewhat aware that the film Spookies originally started out as a film called Twisted Souls and later had new footage shot in order to replace certain segments. What they might not know is just how wild and crazy the filming process actually was. And that was before another director was called in to finish the film! Bela Lugosi once did a decidedly odd promotion for a restaurant in California involving fried grasshoppers and other unusual foods. As a fan of the 90’s horror comedy Freaked, I was shocked to learn that a novelization, toy line and comic book based on it had been released around the time the film was originally released. The 1966 film Chamber of Horrors was originally filmed as a made-for-TV movie to act as a pilot for a series called “House of Wax.” However, it got a theatrical release after it was deemed too violent for TV and had its “Fear Flasher” and “Horror Horn” gimmicks added in order to pad out the running time. Valley of the Dragons was made largely because one of the producers had the right to use stock footage from One Million B.C. and because the other producer’s son found a Jules Verne story that had never been adapted in America. Although the belief that the original story was never published in America was incorrect, the comment that it was anti-semetic was sadly true. Many prints of The Hideous Sun Demon are missing a scene where the creature crushes a rat to death. Speaking of the Sun Demon, the infamous “wet pants” publicity picture was due to the actor’s sweat trickling down into that portion of the costume and the film was given a comedic redubbing (and some newly filmed material) in the 80’s to create What’s Up, Hideous Sun Demon (aka Revenge of the Sun Demon on most home video releases). After reading One Thousand and One Nights when he was five years old, H.P. Lovecraft announced to his mother that he wished to be known as “Abdul Alhazred.” Although he later went out of that phase, he did recycle the name as the writer of the fabled Necronomicon. Speaking of which, the book’s fictional translation history is actually an injoke of sorts by Lovecraft. Monster Jokes by Ima Laffin. More Monster Jokes by Ima Laffin. Beastly Laughs: A Book of Monster Jokes by Mark Moore. Monster Laughs: Frightfully Funny Jokes About Monsters by Michael Dahl. Jokes About Monsters by Judy A. Winter also offers interesting photographs rather than use cartoon drawings of monsters like other joke books often do. Spooky Sillies: A Book of Ghost Jokes by Mark Moore. Screaming With Laughter: Jokes About Ghosts, Ghouls, Zombies, Dinosaurs, Bugs, and Other Scary Creatures by Michael Dahl is a bit of a cheat, as it’s padded out with several pages worth of animal jokes. Giggle Fit: Spooky Jokes by Joseph Rosenbloom and Steve Harpster. For those of you who want a steady supply of new horror jokes, just follow 1monstermatt, author of the upcoming Monstermatt’s Bad Monster Jokes Vol. 1, on Twitter. The Amazon preview for the Cthulhu Unbound anthology contains a full view of Linda L. Donahue’s “Noir-lathotep.” As you’ve probably guessed, it’s a humorous mash-up of the Cthulhu mythos and film noir with enough injokes to appease all but the most uptight fans of each genre. I originally discovered The Fright Site in my search for bad movie reviews, but it was the two original horror stories there that really caught my interest. Both Vampire Moon and The E-Leech are unique in that they are presented in an episodic format and are designed to seem like chat room conversations and diary entries, with make for a creepily realistic touch. But enough modern fare, let’s look at some classics next. First up is Joseph Sheridan Le Fanu’s Carmilla, which inspired countless Hammer movies about lesbian vampires. 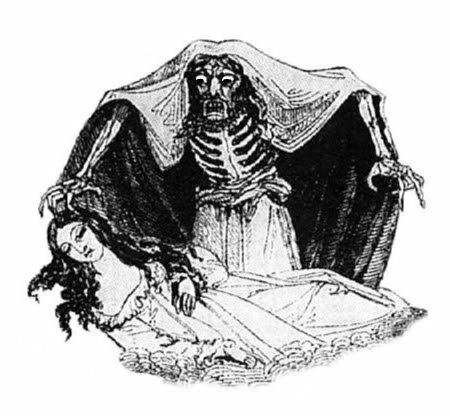 Like Carmilla, the penny dreadful Varney the Vampire is a vampire tale that predates (and influenced) Bram Stoker’s Dracula. It also (allegedly) introduced the conventions of the “tragic vampire tormented by his cravings” and vampires having fangs to horror fiction. Speaking of Stoker, Dracula. was not his only foray into the world of horror. Ones of his other scary stories is Lair of the White Worm, the inspiration for the classic 80’s horror film of the same name. Fans of the film will undoubtedly be surprised at how different the original story is compared to the film. I actually think it’s better that the film was a loose adaptation, as the source material isn’t up to the standards of Dracula and is very politically incorrect. William Hope Hodgson is one of my favorite horror authors, second only to Lovecraft in my mind. That links offers from his strange tales of the high seas to the adventures of the supernatural investigator Carnacki and his electric pentacle. I personally recommend The House on the Borderland, The Boats of the Glen Carrig (which is strikingly similar to The Lost Continent by Hammer Films) and “The Voice in the Night,” best known as the inspiration for the legendary Attack of the Mushroom People. Strange Jason has sung the praises of Algernon Blackwood and I think you’ll understand why after reading tales like The Wendigo The Damned and The Willows (among others). Did you know that The Phantom of the Opera was originally a serialized story by Gaston Leroux? Now you do! After getting some good responses to linking to old GdL16 entries on Twitter, we here at Gravedigger’s Local 16 have decided to start a new feature spotlighting our older material. Each “Flashback” entry will showcase a variety of vintage gravedigger goodness for you to enjoy. Throw back the coffin lid – and RISE! Mothra is actually based on a serialized Japanese novel called The Luminous Fairies and Mothra. Mothra was supposed to battle the unused monster Bagan in a never-realized 1990 film called Mothra vs Bagan. Elements of that script, along with the similarly never made Godzilla vs Gigamoth, were utilized in the 90’s version of Godzilla vs. Mothra. Mothra is said to bear a resemblance to an European Peacock Butterfly. During the DVD commentary for the South Park episode “Mecha-Streisand,” series co-creator Trey Parker revealed that his favorite Japanese monster movie is Mothra. After finishing Gravity’s Rainbow, author Thomas Pynchon was rumored to have been working on a Mothra novel. However, this turned out to be untrue. Wikipedia claims that Mothra’s distinctive chirp was created by speeding up Anguirus’ roar. That section also claims that Mothra was never realized by a person in a costume, which is disputed here. In the American dub of The Magic Serpent, Mothra’s chirp is used as the voice of a giant bird. Similarly, the film’s dragon now has Godzilla’s roar and the giant toad uses Rodan’s cry. The popularity of Mothra among women in Japan prompted Toho to make the 90’s version of Godzilla vs. Mothra. When Mothra was released in America, the distributor suggested that theaters should display radioactive materials in their lobbies in order to build publicity for the film! Eagle-eyed daikaiju fans might notice how the eyes of larval Mothra are red in her cinematic debut, yet they turn blue in Godzilla vs. Mothra(aka Godzilla vs. the Thing in America). In fact, they stay that way for the remainder of the old school Godzilla movies). If you look at official reference guides, Mothra is much larger than Godzilla when she appeared in Mothra and had to be scaled down for her appearances in the Godzilla franchise. In honor of Asian Heritage Month, let’s take a look at the life and works of legendary gorilla suit maker/actor Charles Gemora. Charles “Charlie” Gemora was born on August 15th, 1903 in the Philippines. Stowing away on a ship headed for America, Gemora arrived in California and made money selling portraits on the street in front of Universal Studios. His talent was quickly noticed and he was soon working in the special effects department. This led to his first onscreen role in 1928, a role that became a defining part of his career: a gorilla. 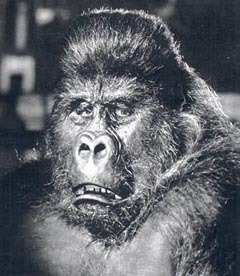 Charles Gemora’s goal of creating the ultimate gorilla costume made him the go-to guy in Hollywood for those looking for realistic depictions of gorillas, while those looking for more monstrous gorillas went to Ray “Crash” Corrigan (and later to his protégé/successor, Steve Calvert) and George Barrows. Back in those days, studios would often hire gorilla suit suit actors since they came with their own suits are were less expensive than building a new suit from scratch. These men often went uncredited in an attempt to make audiences think that the onscreen gorillas were real (as was common with many horror films of the time). Gemora’s costumes often made use of muscle padding and his “water bag” invention, which created the illusion of rippling stomach muscles, so it’s understandable that some studios would be tempted to advertise them as the real deal. One film, the infamous hoax documentary Ingagi, even tried to pass off scenes of Gemora in costume as documentary footage! However, this (and many other outlandish claims made by the risqué fauxumentary) were exposed in an official investigation. His reputation as a gorilla suit actor was so great that rumors claiming that he originally played King Kong started circulating! 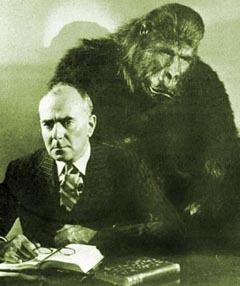 Many just couldn’t accept that anything other than a man in a suit could have created what they saw onscreen, despite the fact that Kong was created using stop-motion animation (along with a large fake hand and mechanical bust for certain close-ups). Soon the rumors started saying that Gemora himself made the claim! However, he always denied any involvement with the film and the rumors seem to have stemmed from his playing a King Kong parody in the never-completed movie, The Lost Island. In case you’re wondering about the quality of his costumes, here are two pictures of the costume Mr. Gemora constructed for 1941’s The Monster and the Girl. Similarly, here is a picture of the suit he made for 1954’s Phantom of the Rue Morgue. Compare that to these two gorilla pictures. Similarly, compare them to the King Kong costume used in 1986’s King Kong Lives. As you can see, he was truly a man ahead of his time. Castings made from one of his costumes were even used to create a Don Post Halloween mask! In addition to gorilla costumes, he also designed monster costumes for films like The War of the Worlds and I Married a Monster from Outer Space. To learn more about Mr. Gemora and his creations, please visit this article from Monster Kid online magazine and Gorillamen.com’s interview with his daughter.